I have something pretty special for you tonight. It's taken me a bit of time to put together, but hopefully you will find it interesting. A couple of weeks ago, I finally had a chance to meet and catch up with Hayley, the creator of Emily de Molly nail polish. Hayley and I live in the same city, but this was the first time we had met. We arranged to meet for a coffee catch up, and I prepared a few questions to ask her and report back here on my blog. So your name is Hayley, then who is Emily de Molly? Well Emily is actually my dogs name, she is like my baby and I love her so much that I wanted to include it somehow. Molly is actually the name of one of my best friends dog, and it was her husband who came up with the combined name of Emily de Molly, which I thought sounded catchy. 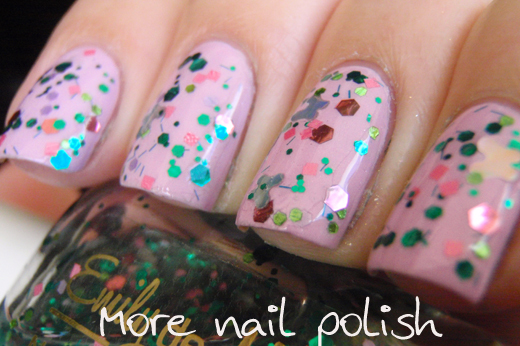 How long have you loved nail polish for? I’ve really liked nail polish since childhood, but only in the last year or two has my love of polish really taken off. When I told my mum about making my polishes, she wasn’t surprised at all. She reminded me that I used to mix my polishes together when I was younger, so it’s only natural that I would still love mixing them up now. Where do you get your inspiration for new shades? Most of the time its just from looking at all the glitters I have in front of me and seeing which colours go together and how they can be matched up with various base colours. Although, there are some polishes that have been developed off some definite inspiration. Majestic Flight for example is based on a peacock. I love the combination of colours that peacocks have, so this polish has the same teals, blues and greens. What’s your lab set up like? Ha ha, well I used to work out of the spare room, but now I have a set up in the garage with a huge desk and where there is plenty of air and light. When I first started, I used to mix one bottle at a time using tiny measuring spoons and keeping up with stock was very easy. But now my production has increased a lot. Tell me about your polish production and how you find time to do it all. At the moment I’m still working full time, and then I usually put in another 4-5 hours after work at home testing, mixing, shaking, labeling and packaging polishes. I also work on polishes all weekend. It’s fun but also a lot of work. I usually make up small batches at a time, about 20 bottles. I measure out all my glitter ingredients, tints and bases and spend a lot of time shaking big bottles! In an evening after work I can usually make up about 100 bottles. My orders for overseas suppliers range from around 100 polishes to over 1000, so when I get an order I’m working flat out to fulfill it as quickly as I can. What is the best part about making your own line of polishes? Definitely being able to make whatever I want. I haven’t had the need to buy very many polishes recently, because I love the things I make, or if I see something I love, I can usually make it myself. Curling glitter, in fact glitter testing in general. I have so much glitter at home that I just can’t use. Luckily I’ve never had any glitters I’ve purchased bleed on me, but curling glitters happen all the time. 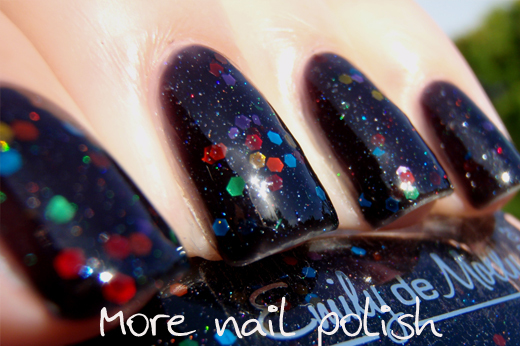 So even though glitters are marketed as solvent stable, it still doesn’t mean they will be ok in polish. I test all my glitters in straight solvent, which usually speeds up the testing time. But I’ve recently learned that some glitters can curl up to 5 or 6 months later, and I believe the reason why is because of heat. Being in Australia we are working in the opposite hemisphere of the world, so when I’m working in winter, my polishes are being worn in summer in the USA, and that temperature change has resulted in one or two glitters starting to curl. It’s such a difficult thing for indie polish brands to have to manage. Its fantastic that your polishes are now available overseas from either Shoppe Electicco and Llarowe, but how do you go with shipping your polishes overseas? Yes, that’s another thing that is very time consuming, and probably something not too many other indie sellers have to worry about - packaging for dangerous goods. To legally ship my polishes and meet Australia’s very strict shipping requirements, I must sticky tape the lid of every bottle, individually wrap every bottle in wrap or paper towel and then place each bottle in its own zip lock bag. These are then couriered to my dangerous good shipper who then packages them again using various absorbent packing pads, cardboard packers and other things to ensure the box meets the requirements. Some of the tests that have to be met by these packages include a 2 meter drop test, where the box is dropped from 2 meters and nothing is allowed to break and the 50 kilo pressure test, where the box has a 50 kilo weight placed on it for 48 hours, and the box isn’t allowed to buckle. So just getting my polishes overseas is a huge hurdle and I’m so excited to finally be able to offer this. Hayley and I then went on to talk about how indie polish makers are treated differently to commercial brands. We both wondered why indie seller were held to much higher standards. For example, Hayley has refunded money to any customer who is unhappy with any of her earlier polishes that developed curling glitter after 5-6 months. Commercial brands wouldn’t do this, but nor would consumers generally ask for a refund for a curling commercial brand. This led us to talking about the cost of polish and how expensive nail polish is in Australia. Here, where Revlon is $15, OPI $20 and Chanel $40, any indie polish at a $10 price point is very good value. Whereas in the US, where polish prices are so much cheaper, a $10 indie is considered an expensive polish. We also talked about the difficulties of there being so many indie polish makers now that it is very hard to come up with unique ideas for polishes. Hayley commented that on many occasions she had thought of an idea for a polish and then googled it, only to see that one or more indie sellers had already created similar polishes. I certainly think there has to be a saturation point at which time there isn’t anything new to create. I mean there are only so many colours and shapes of glitter and so many combinations that you can make with it. We also discussed how it’s only natural that certain glitter types lean towards certain types of polishes (eg stars and moons in a dark blue base representing the night sky, or say butterflies together with spring pastels), therefore its even more likely that many brands would come up with the same idea. Hayley also told me how much she hates curling glitter. I explained that while I prefer there to be no curling glitters in a polish, I’m ok with a reflective curl that can be smooth with two coats of top coat. Hayley was very passionate about her hate of curling glitter, so it certainly made me feel that she was very conscious of her polish quality and ensuring it meets her standards. I had a fantastic time meeting Hayley and talking about polish. What was suppose to be a quick coffee catch up ended up being a three hour long chat, whoopsie! Of course, Hayley was very generous and bought along 10 more bottle of her polishes for me to try. She always says to me, just try them out and let me know what you think. You don't have to blog about them. This is another reason I can tell that Hayley is so passionate about her brand and quality. Today I have five of the polishes to share, I will get the other five up ASAP, as I just finish swatching them all today. 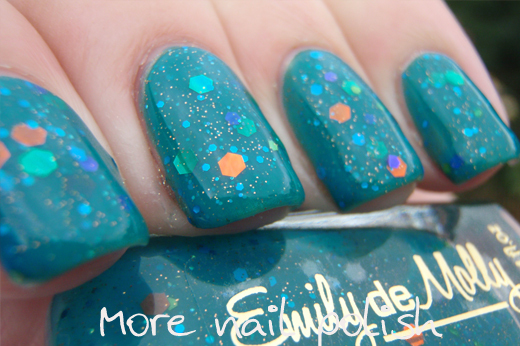 Majestic Flight - a teal blue/green base with lime, green, copper, orange, blue and purple glitter. Three coats with Seche Vite top coat. Warrior Princess - has blue, purple and pink fine glitter and micro holographic glitter. This was two thin wiped coats layered over Revlon Royal. You could easily reach opacity on it's own with this, but it looked freaking amazing over Royal! Topped with two layers of top coat. Flutterby Garden - two coats layered over Picture Polish Twinkle. This has green, lime. lavender and pink hexes, pink squares, ultra fine green bar bar glitters and silver holo butterflies. 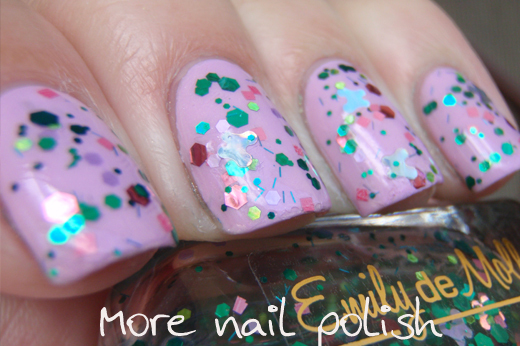 If you don't like bar glitter, than this polish wont worry you at all. The bar glitters are so thin a fine you wont have any issues. Flutterby Garden - Cause I'm more of a green polish gal rather than a pink one, I had to try Flutterby Garden over a green base. I like it over green much better The butterflies are easy to get out and placement on the nail is pretty good too. 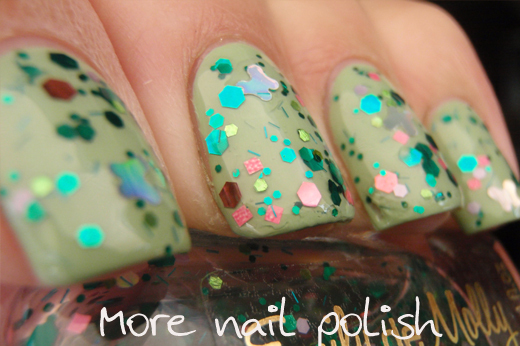 This polish really is just like freshly cuts grass with wild flowers in it! Two coats of Picture Polish Mint. Muted Madness - Jelly black base with red, blue, purple, yellow and green matte glitter and a fine holographic silver sparkle. 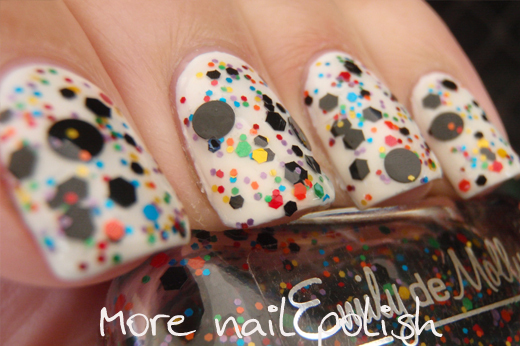 There are a lot of indies with white jelly bases with a mix of rainbow glitter, but I love this black version. I also madly love matte glitter. It's so much easier to photograph than regular shiny glitter, you actually can take photos of matte glitter in the sun. This is three coats with Seche Vite on top. Abstract Canvas - large black circular glitter, black hexes, and rainbow glitter in two hex sizes. This is two coats layered over Ulta3 Lily White. A white canvas just seemed to be the right base for this. Love the circle glitter. What's so amazing about circles I don't know, cause they are just dot, but I think they look awesome. You can get Emily de Molly polishes from her Etsy Store if you live in Australia, through Llarowe in the USA or Shoppe Electicco in Singapore. I recommend following their facebook pages to get the latest information about releases and restocks. What a great interview! Thank you so much for sharing your coffee break :) As for Abstract Canvas - how about those dots - they are really eye catching! 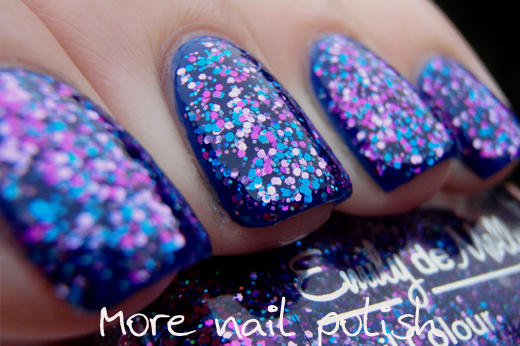 What gorgeous polishes! The first one is particularly striking. Venturing into the world of indie polish sounds exciting. I hear the point about nail polish prices around the world, though. In the UK, we're lucky to have quite a wide range of both high and low end polishes available to buy. I love Majestic Flight, it is gorgeous! I found this interview fascinating, thanks for sharing. I really love indie polishes, but I agree that there has to be a saturation point, and I wonder if we're getting close to it. It seems like there is a new indie brand popping up almost everyday. The quality also varies dramatically and that can be an issue. There are people like Hayley, testing out her glitters thoroughly before using them, than there's others who seem to just put something together and then make it available on Etsy. But I don't necessarily agree that the service from an indie maker is better than the bigger brands. It really depends on who you order from. I order Essies, China Glaze and OPIs from a company called Nail Polish Canada (I'm in Canada). Their service is excellent. I know that my package will ship out and if there's any issues they will deal with it promptly. But I've bought stuff off of Etsy that doesn't ship out for 2 weeks without any notice or information from the seller. Shipping is a major issue for indie polishes, and I'm glad you addressed this. I've seen recently a few US sellers suspend international shipping, and I've also heard that US shipping will increase early next year, which will effect anyone buying from a US indie maker. I don't know what the solution is, but I think it's definitely an important issue. This is such a great post! The polishes are just amazing! I really like Majestic Flight! Thanks both to you and to Hayley for this post. 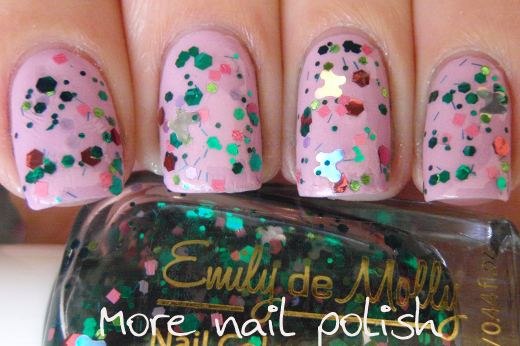 I've never wanted polishes more than the ones I want from Emily de Molly. I am soooo excited that I will be able to get them from Llarowe!